Kent Paranormal is attending an event hosted by Ghost Hunter Tours at The Theatre Royal, Margate on the 14/07/18. The theatre dates from 1787 and was radically altered in 1874 by Jethro T. Robinson (father-in-law of Frank Matcham, the famous and prolific theatre architect who along with his two protégés are responsible for more than building 200 theatres before 1915). It is listed Grade II* and is sited within a conservation area. 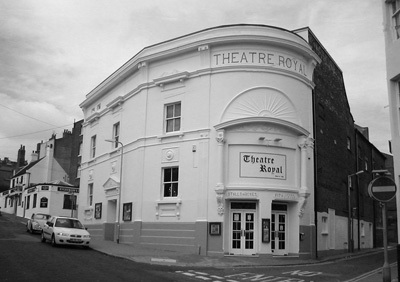 The Theatre Royal, sited at the north east corner of Hawley Square, was part of the planned expansion of the small town and port of Margate during the mid Georgian period. It was built to vie as a facility for the entertainment of the upper classes with the Assembly Rooms, Cecil Square (1770s), and the Circulating Library, Hawley Square (1786), both now demolished. The 1874 conversion marks the transition of the theatre from a Georgian boxed Playhouse into a Victorian Theatre. The stage was shortened and a second floor ‘gallery’ level added to the expanded auditorium. As well as welcoming some of the greatest acting ‘stars’ of the Victorian era, the theatre was the site of the first drama school in the country, the School of Acting opened by Sarah Thorne in 1885, and attended by a young Edward Gordon Craig, who went on to become the undisputed father of modern theatre design and was arguably the most important theatre practitioner to come out of Britain since Shakespeare.On June 27th 1787 the Theatre Royal Margate opened it’s doors for the first time. The first performances were “She Stoops to Conquer” and “All the Worlds a Stage”. The theatre has over 200 years of tradition and hosting performances, each performance holding up to 2000 people in one sitting. Unexplained figures have been seen on stage, along with piercing screams of what appears to be a woman. Objects have been seen being moved along with guests who dare to be there after night time falls.